Since very early times, women have been inventing ways and means of beautifying themselves, mehendi being just one of them. Stylish, sophisticated and spiritual, mehendi is definitely here to stay. Whether you choose to doodle a little or decorate yourself intricately, mehendi(henna) is one of the oldest and most promising ways to enhance your beauty. 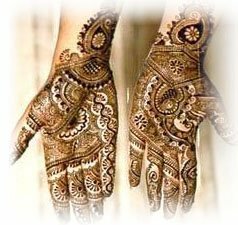 Though initially North Indians were the most ardent users of Mehendi, over the years, it has spread out to almost all the areas in India cutting across religious, regional and linguistic barriers. No ceremony, religious, festive or otherwise in India is complete nowadays without women adorning themselves with Mehendi. A relatively foreign concept to westerners, it recently found way to the masses when rock singers & Hollywood stars sported Mehendi designs on their hands and faces. Mehendi is now considered “cool” and the “in-thing”. It is also gaining popularity as a painless temporary tattoo. The preparation of henna paste is quite simple. 4 teaspoonfuls of henna powder requires just 2 teaspoons of eucalyptus oil and 1 teaspoonful of sugar. The mixing of 1 tsp lime juice (citric acid) results in rich red colour, but in this case, mehendi fades away in 5-6 days. But make sure that the paste is smooth & lump free. This paste is used in plastic cones for drawing the designs. A mehendi cone is also available at beauty parlours, salons and shops. Though the basics are the same, the skill in designing varies from culture to culture & country to country. Swiftly, the cone moves. The flowing paste gently forms wondrous patterns at a fascinating speed, and lo! a uniquely enchanting design is created. To the layman, mehendi designing usually appears a lavish display or artistry. 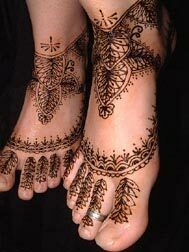 But it is just a little skill and creativity that is required for mehendi designing. A twist here and a turn there lead to a new design. While applying as the paste dries, it is advisable to pat the design, with a solution of sugar and lime juice. This prevents the dried flakes from dropping off and adds to the final colour effect. Wait for at least 8 hours before washing the design. The longer the mehendi remains the darker the colour will be and the longer it will last. 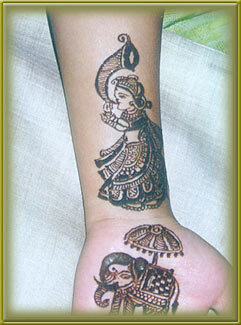 Remember mehendi lasts longer where the skin is warm, even and least used: palm, sole, etc. Designs fade rapidly where skin exfoliates quickly: upper back, upper chest, back of hand etc. Henna has also long been used in ayurvedic medicines because of its cooling properties and is considered an anti-irritant and antiseptic. Even a henna plant’s fragrant white flowers are used to make perfumes. Applying mehndi is therefore risk free as the paste is completely natural and temporary; the designs will fade away on their own after about two weeks. i've used henna when I was little. My mom would apply it every 2 weeks, religiously! She never missed a day! I used to hate it. But now when I look at my old photos I wished I would still use it. My hair had a natural shine, it looked very healthy, thick and long. Oh and btw, real good henna does color your hair if used continuously...My natural hair color is black, but henna added this eggplant like color to it. It was very pretty in the sun. henna is very good for your hair it has lots of herbs and plants that are very good for your hair it will make your hair thicker healthier and redder depending on how long you leave it on....i think its better to shampoo your hair before and after using henna. before because it will get rid of all the oil and dirt that might have gotten in your hair and also shampoo after..while you are in the shower rinse off most of it then shampoo. the only thing i have ever used mixed with henna is an egg you make the henna as you usually would and add 1 raw egg then apply to your hair. Henna leaves are very effective in the treatment of skin disorders like boils & burns. Coarsely ground Henna leaves applied to the affected parts cures the disorders. It can be applied beneficially in rheumatic joints, inflammatory swelling, bruises & leprosy. While using mehendi leaves, it should be ensured that they are not whole and unbroken after grinding. Henna does leave its deep red-brown stain on the skin until the Lawson molecules are not released from the leaf and this happens only when the leaves are properly grinded. So, people prefer using the henna powder for this form of body art. You need to mix henna powder with lemon juice, strong tea or other mildly acidic liquid, apply this paste and leave it on for about 10 hours to dry. Later, you can scrap it off with a blunt knife or a spoon.